Alliance for Democracy Monterey County has sponsored four US Uncut actions locally - two against Bank of America, one against Fed Ex and one against Apple. We support US Uncut's message that corporations need to pay their fair share of taxes and if they did pay we would not have to have all the cuts in services which are hurting so many people. 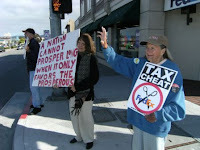 We have our own Facebook page (US Uncut Monterey) and post our actions on the US Uncut website - we have had new people attend each event and good turnouts even though it rained on two of our actions. 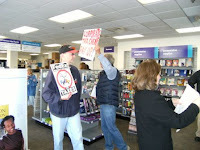 At Apple and Fed Ex we left the street and entered the store with our signs and made some noise before leaving. 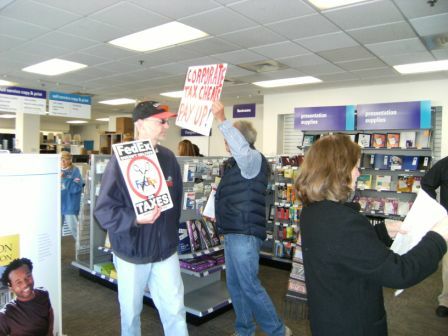 The verdict was that doing this was fun and we plan to continue working with US Uncut to put pressure on tax-dodging corporations.